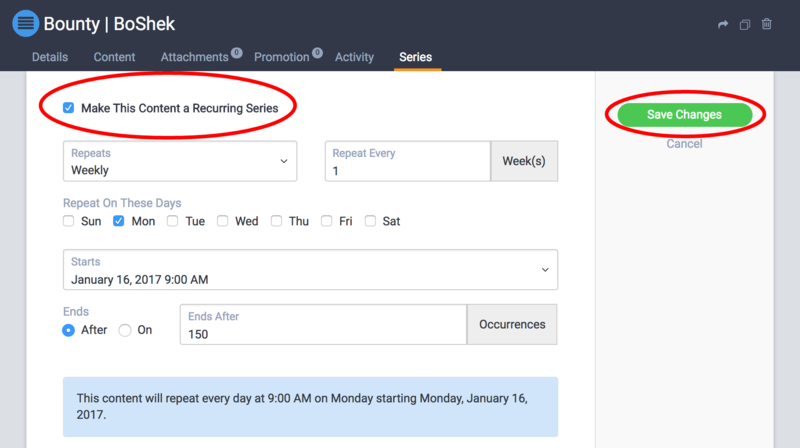 This article walks through the details of creating and managing a recurring content series, which works much like a setting up a recurring event or meeting in most calendar applications. For decades, publishers have been utilizing recurring topics and content themes to generate interest and build audience. This content tactic certainly hasn't slowed down in the digital era. With this in mind, DivvyHQ gives you the ability to create a single content item (a social post, blog post, etc.) and turn it into a recurring series, which saves you time by duplicating the original item and automatically adding the new entries to your editorial schedule. Click Save Changes to save the content item's details. Now, click the Series Tab. After clicking the Series Tab, click the checkbox next to the text 'Make This Content a Recurring Series'. After you check the box, select how often the content item repeats (daily, weekly, monthly, etc. ), on what day the recurrence starts, and when the recurrence should end. These settings should be relatively familiar if you've ever set up a recurring event in Google Calendar or Outlook. When done, click Save Changes. You'll now have multiple copies of your original content item displayed on your Divvy calendar. Each content item can be edited individually. You can also elect to update "all future items" in the series if bulk changes need to be made to all future content items in the series.